By itself, the name “silky lean meat paste” evokes thoughts of the silky aspect of this speciality. 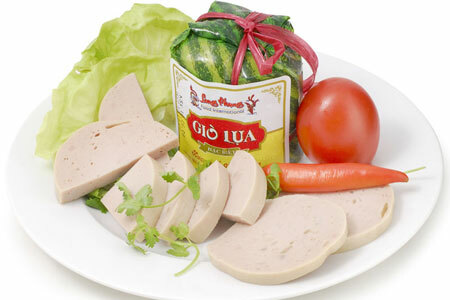 Gio lua is made with lean pig meat, which is pounded with a pestle until it becomes a sticky paste. Fresh banana leaves are tied very tightly around the paste, and then it is well cooked. Good gio lua has a fine white colour, is firm, and has a perfumed and sweetish taste. 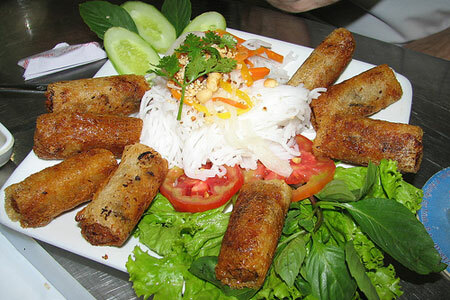 Gio lua may be obtained anywhere in Viet Nam, but the best gio lua is from Uoc Le Village (Ha Noi), where the know-how for Gio lua is strictly kept so as to allow no secrets of the job to flow out from Uoc Le. Slices of Gio lua are slightly pink, moist, and sweet-smelling meat, fish sauce and banana leaf.